April is National Poetry Month, created in 1996 by the Academy of American Poets to celebrate an ancient literary genre that captures readers’ minds and hearts as powerfully today as ever. Rochester has, for generations, taught students the pleasures and possibilities of poetic expression, counted famed poets among its faculty, and hosted an array of writers who have made exceptional contributions to the art of verse. 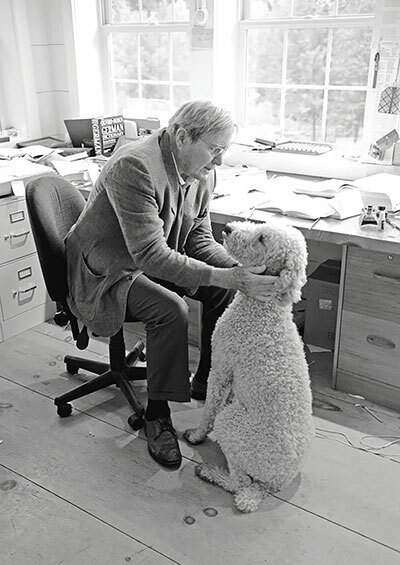 Pulitzer Prize–winning poet Galway Kinnell ’49 (MA) was often compared to Walt Whitman for his lyricism. When he died in 2014, Rochester Review remembered him with a selection of his thoughts on the practice of poetry. This story originally appeared in Rochester Review, January–February, 2015. Galway Kinnell ’49 (MA) was a towering figure, both literally and as a poet. Part of a postwar turn away from the modernism of Ezra Pound and T. S. Eliot, Kinnell strove to craft accessible poems from the material of everyday life. The centerpiece of his first published collection, a 14-part poem about Manhattan’s Avenue C called “The Avenue Bearing the Initial of Christ Into the New World,” made his reputation, and inspired frequent comparisons to the lyrical style of Walt Whitman. Kinnell, who died in October, wrote 10 collections of poetry. His 1982 book, Selected Poems, won both the Pulitzer Prize and the National Book Award. In 2000, he returned to Rochester for a reading and lecture as part of the Hyam Plutzik Memorial Poetry Series. The University awarded him its highest honor for alumni, the Hutchison Medal, in 2001. In 1982, Jeffrey Mehr ’78 interviewed Kinnell for Rochester Review. The entire interview is online.